Red-winged blackbirds are interesting because of their unique look and predictable behavior. 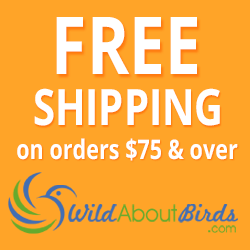 For a small bird, the Tufted Titmouse makes a big impression! 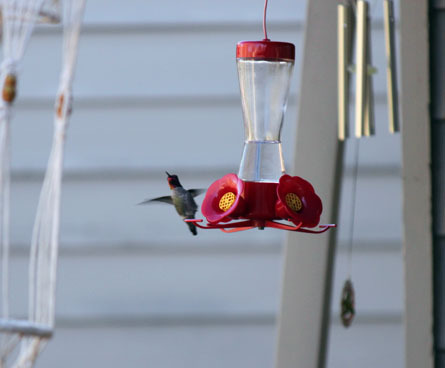 Anna's Hummingbirds are a common sight in the Northwestern part of the United States. 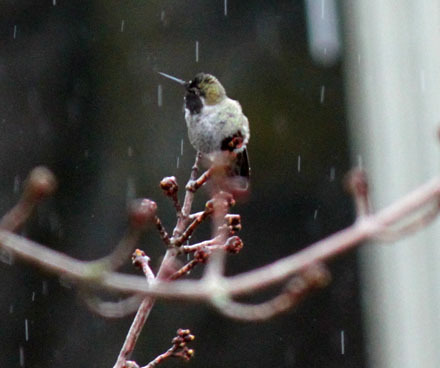 While visiting the Pacific Northwest I was enamored by a pair of hummingbirds I saw in a neighbor's yard. I first spotted the hummingbirds at a hummingbird feeder. They would make trip after trip to the nectar-filled feeder and then rest together. Their quick zips around the yard helped me locate their perches. A nearby tree was the perfect place for these hummingbirds to relax between their (very frequent) meals. Simple hummingbird feeders like this (and sugar water as nectar) are really all it takes to attract hummingbirds to your yard. 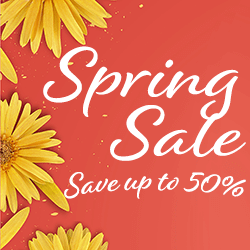 If you see hummingbirds near your flowers, or watch them buzz around a neighbor's feeder, try putting up a feeder to get an up-close view of these fast little birds. Hummingbirds are territorial and that was clearly demonstrated as I observed the lone hummingbird feeder hanging on a porch. The adult male Anna's Hummingbird was fascinating to watch as he switched back and forth between hovering near the female and chasing rival hummingbirds away from the feeder (which he clearly considered his). 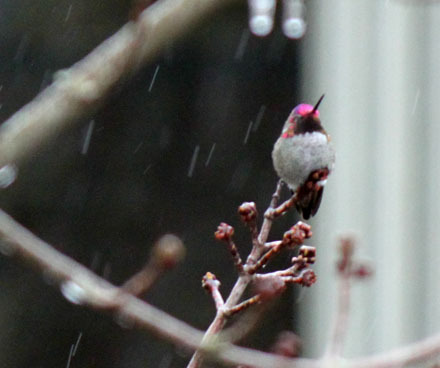 When this Anna's Hummingbird landed on the hummingbird feeder or nearby branch, you could plainly see the bright pink colors on the hummingbird's throat and crown. As the rain began to come down, he looked right at me. As he moved in and out of the light coming through the trees, I was able to catch an occasional glimpse of his bright colors. 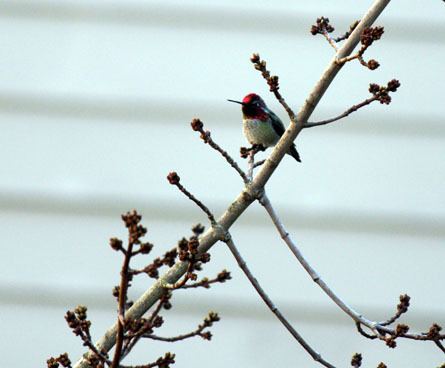 As they moved across branches and around the yard, these hummingbirds were such fun to watch. For the rest of my trip, early mornings were spent watching the hummingbird feeder and the trees nearby. The hummingbirds returned every day to the feeder and were often easy to see in the adjacent trees. 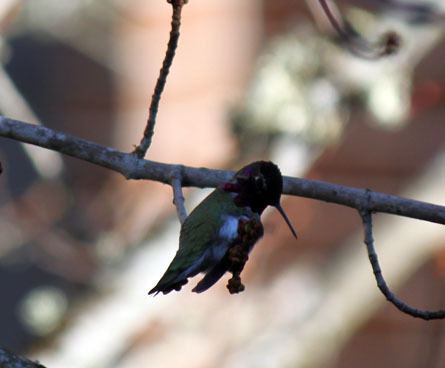 One one occasion I was even able capture the male hummingbird grooming himself. Finding the Anna's Hummingbirds was a real treat and I look forward to my next visit to see these amazing little creatures. 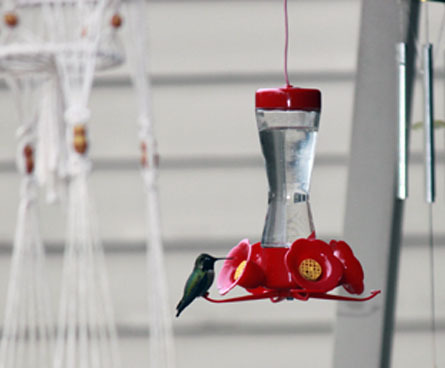 If you want to attract hummingbirds like these Anna's Hummingbirds to your yard, try adding some flowers that attract hummingbirds or a new hummingbird feeder. Hummingbirds have a hard time resisting the delicious nectar they provide. Photo Credit: Photos by WildAboutBirds.com photographer Judy_NMMI.